Blotters have come up in several posts lately so it’s time for a brief explanation for folks unfamiliar with or new to the concept. By definition a blotter soaks up liquid. Nothing special about it. Something as simple as a tissue will do and I have used one on many occasions. A folded sheet of printer paper can work as well. If you want something designed for the purpose or that is more absorbent, some retailers carry blotter sheets or smaller versions that are about the size of a bookmark. J. Herbin makes really nice ones. My experience with using the real deal is they are worth the investment. The one below is at least six years old and just recently starting to fray. A blotter can be used between pages when you close your journal to prevent smearing. A large one can be used behind the page on which you are writing to prevent ink bleeding through to the following page. It can serve as a convenient bookmark as well. A blotter is a simple solution to ink smears and bleed-through for any type of pen but earns a highly recommended rating for fountain pens. This is one tool that everyone can use. Have you tried the ‘rocker’ type blotter? I bought four sheets of A3 blotting paper very cheaply, a rocker blotter on e-bay and I’m all set. Rockers are cute and a collectible for some folks. I have a jade colored horse but seldom use it. Putting a blotter between pages of my journal is all I usually need. What does yours look like, Davey? 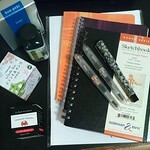 The J. Herbin blotters are a little thin; I like the thirsty 120 lb. blotter paper from John Neal Bookseller (item #S-261). 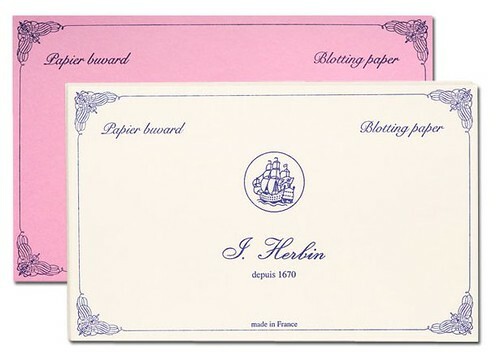 Another thing you can do (especially if your journal has a Moleskine-style pocket in the back) is cut an Herbin blotter to the appropriate size so you’ll always have one with you. I also slip one of the thin credit-card-size magnifiers in as well. These are some great ideas, especially with the tip about the pocket. I have several things tucked in there, but never extra pages of scrap paper to use as a blotter. Why would you need a cushion sheet underneath whatever you’re writing on? I’m just starting to learn calligraphy, and I haven’t read anything about that. If you write on a single sheet of paper on a hard surface like a tabletop, the writing surface can be too hard–a little bit of resiliency is a good thing. This is the same reason people like to use flexible nibs. Hard surfaces are especially unfriendly to pointed-pen styles like Spencerian or Copperplate; most teachers will hand out a cushion sheet on day one. It’s less of a concern in the broad-edged-pen world, and you don’t need one with the heavier papers usually used for finished pieces. The (broad-edge) calligrapher Ieuan Rees carries a piece of Welsh wool felt around with him and unrolls it when he’s beginning to write! Classiest cushion sheet ever. Thank you, Joseph, for the explanation. Thank you for the information. My mom did calligraphy when I was little, and I’m trying to piece together what I remember from watching her with what I read in books. I am going to make sure not to write directly on the hard desk.